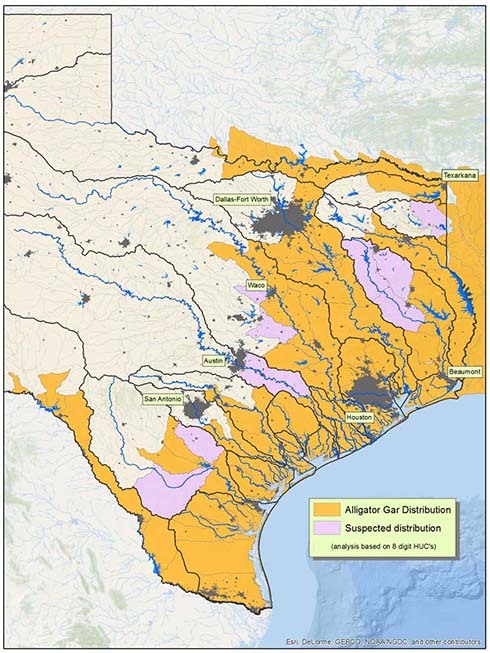 Known and suspected range of alligator gar in Texas. It’s often thought that alligator gar can be found in lakes and rivers throughout Texas, and that every gar you see is an alligator gar. In fact, there are four different species of gar in the state and many of the gar people observe in nature aren’t alligator gar at all, but one of the other, more common and widely distributed species like the longnose or spotted gar. So where can you find alligator gar in Texas? In the north, they can be found in the Red River (including Lake Texoma), the upper Trinity, and the Sulfur River. In southwest Texas, they can be found in the middle and lower Rio Grande, including lakes Falcon and Amistad. In East Texas, they’re found in Cypress Creek, the Sabine, Neches, Angelina and Trinity Rivers, and in mainstem reservoirs including Caddo, Sam Rayburn, Toledo Bend and Livingston. Some remnant populations exist in off-channel reservoirs such as Richland Chambers where they were present prior to impoundment. Along the Texas coast, alligator gar can be found in nearly every river system draining into the Gulf of Mexico, including the middle and lower Brazos, Nueces (including Lake Corpus Christi), Frio (including Choke Canyon Reservoir), San Antonio, and Guadalupe rivers. Alligator gar, like other gar species, are tolerant of salt water, and can be found in every coastal bay system in Texas, including Galveston, Corpus Christi, Matagorda, San Antonio and Laguna Madre — and within the intercoastal canal system. There are many anecdotal reports of alligator gar in central Texas reservoirs, from San Angelo and Abilene to Waco and Austin, but Texas Parks and Wildlife Department fisheries biologists have never confirmed one from any of these reservoirs. Most likely, gar observed in these systems are longnose or spotted gar. Learn how to identify the different gar species.